Two years ago, the Obama administration and U.S. Secretary of Education Arne Duncan raised eyebrows and garnered criticism from school reformers when it allowed Virginia’s state education officials to retroactively set the proficiency targets it had to meet under the No Child Left Behind Act — and make the performance of its schools look better than reality. 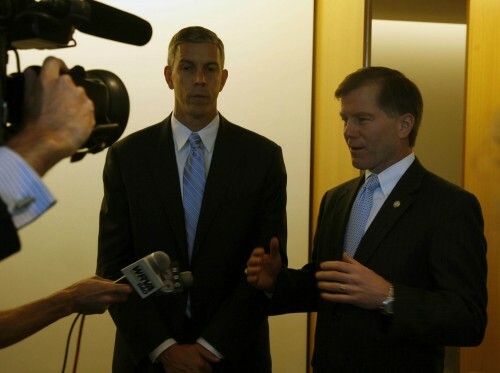 So it would make senses that the administration would embarrass itself again — and stain both Duncan’s and President Barack Obama’s otherwise admirable reputations on the school reform front — by, yes, allowing Virginia (along with Arkansas, Missouri, South Dakota, and Utah) to evade No Child’s accountability provision as part of the administration’s misguided waiver gambit. Thanks to today’s move, Virginia will be able to evade accountability, especially in improving achievement for poor and minority students, by using a “proficiency gap groups” measure that may actually obscure data on how well those kids are doing. The state can also do little on improving its mediocre curricula and standards — and in the process, doing little to help our children know their own names — and get away with it. And it won’t be forced to get tough with districts such as Fairfax County or force failing districts to revamp their operations. Duncan and Obama should both be embarrassed about approving Virginia’s waiver package. Because it is a shameful proposition not worthy of the paper upon which it is written — especially in light of the Old Dominion’s failures to embrace systemic reform. And it weakens arguments made by the administration that the waiver process will further systemic reform by getting rid of what it considers a broken law that never really was. Dropout Nation has long argued that the Obama administration’s waiver gambit, as much driven by a desire to put its mark on federal education policy (and stamp out that of predecessor George W. Bush, upon which the administration’s own reforms have been built) as by the lack of movement within Congress on reauthorizing the law, weakens the decade of strong reform efforts which the law’s accountability provisions helped usher. By eviscerating No Child’s Adequate Yearly Progress provisions, the administration also takes away real data on school performance, making it more difficult for families from being the lead decision-makers reformers need in order for overhauls to gain traction, and making it more difficult for researchers to do their work. By allowing states to focus on the worst five percent of schools (along with another 10 percent of schools with wide achievement gaps), the administration is also letting districts not under watch off the hook for serving up mediocre instruction and curricula; the fact that the administration is pushing states to enact and implement “college and career-ready” standards (including the Common Core’s reading and math guidelines) as a condition of the waiver is meaningless because it cannot by law force states to follow up on its promise by putting actual curricula in place. The waiver gambit is legally questionable, especially given that as much of the process involves allowing states to avoid enforcing whole sections of federal law. And in blessing moves to replace subgroup accountability with A-to-F grading systems and “super-subgroup” measures, schools and districts can ignore their obligations toward the poor and minority kids in their classrooms and still appear to be exemplary. But in approving Virginia, the Obama administration also makes wonder whether it is actually paying attention to what is happening in the very states who are receiving the waivers. Dropout Nation raised this question last month after New York and Ohio gained waivers despite the fact that much of the reforms both states offered up as justification for gaining them were either being contested by affiliates of the American Federation of Teachers or hadn’t been approved and implemented. Now the question goes from being raised to being proven a reality with the administration’s approval of Virginia’s waiver request. Anyone who has paid much attention to the Dominion State knows that this is one state that needs more pressure from the federal government to do well by its students. Despite its reputation as being home to some of the better-performing traditional school districts (including Fairfax County and its overly inflated reputation), Virginia is lagging when it comes to improving student achievement. While the percentage of Dominion State fourth-graders reading Below Basic (as assessed on the National Assessment of Educational Progress) has declined from 36 percent in 2003 to 32 percent in 2011, the decline is slower than that of aggressive reform-minded states such as Florida (where levels of illiteracy among fourth-graders declined from 44 percent to 33 percent during that same period), and otherwise reform laggard states that focused strongly on improving literacy such as Alabama (which saw a 15 percentage point decline in that same period). Meanwhile the average Virginia fourth grader reads half a grade level better than a similar student did nine years ago, staying apace of the nation as a whole. but other states have made greater gains; the average Florida fourth-grader, for example, reads almost a full grade level higher than a similar student nine years ago, while the average Alabama fourth-grader reads one-point-five levels ahead of a similar student nearly a decade ago. Virginia’s educational doldrums is even more pronounced when one looks at how poorly the state has done in improving the achievement of young men, who most-heavily experience the consequences of the nation’s education crisis. Fifty-three percent of the Dominion State’s young black men in fourth grade were functionally illiterate in 2011, a mere one point decline from nine years ago; this trails the eight percentage point decline nationwide, and the even more dramatic 13- and 16 point declines in functional illiteracy among young black male fourth-graders in respectively, Florida and Alabama. While the functional illiteracy rate of 22 percent for Virginia’s young white male fourth-graders is five points lower than it was in 2003 (and better than the four percent decline nationwide), it is much lower than Florida’s 11 percent decline in functional illiteracy, and the 16 percent decline among Alabama’s young white men. Nor has Virginia done much to improve the academic performance of its poorest children. Although the percentage of Virginia fourth-graders struggling with literacy declined from 53 percent to 48 percent between 2003 and 2011, that five point decrease is lower than Florida’s 13-percent decline, the 18 percent decrease that happened in Alabama, and the seven percent decline nationwide. The self-satisfaction with the status quo among Virginia’s education and state leaders is part of the problem. The state continues to stand pat on reading and math standards even as 45 other states and D.C. improve their own by enacting Common Core standards. While Virginia’s reading standards are still on par with Common Core, according to the Thomas B. Fordham Institute’s report two years ago, the math standards were considered “clearly inferior” than that being undertaken by other states. The state’s fourth grade math standards wouldn’t have met the standards set by Singapore and the six other top-performing nations in that subject, according to the American Institutes for Research’s own analysis of American curricula standards. By standing pat, Virginia has all but assured that its children, especially those from poor and minority backgrounds, will continue getting an education unfit for their futures. Meanwhile the state allowed districts such as Fairfax County to evade their responsibilities toward preparing all children for success in higher education and life through its Virginia Grade Level Alternative assessment regime, which allowed districts to offer low-quality curricula to kids they didn’t want to work hard to education. Only last year, after reports about the cheating of kids from Washington Examiner editorialist Barbara Hollingsworth and others, did state officials finally put the kibosh on the gamesmanship. This unwillingness to revamp its standards is matched by the continued opposition to overhauling teacher evaluations, expanding school choice and Parent Power, and embracing innovative approaches to providing instruction and curricula. An effort earlier this year to allow principals and districts to remove laggard instructors was defeated in Virginia’s state senate, thanks in part to the decision by the upper house’s majority leader, Tommy Norment, to “stick with my family” (and do the bidding of the state’s National Education Association affiliate) than to take steps to help all children get high-quality teachers. It took three years for the Dominion State to pass a weak form of voucher-like tax credit plan that is all but worthless in expanding choice; the state has also done little to expand charter schools. And the unwillingness to consider Parent Trigger laws and other measures to give parents real power in education is also shameful. Meanwhile the lack of leadership from Virginia Gov. Bob McDonnell has been even more abysmal than that of Alabama counterpart Robert Bentley. Since taking office three years ago, McDonnell has been reluctant to aggressively leverage his political capital (and general popularity) to advance systemic reform. Despite the fact that his party had control of both legislative houses this year, the most McDonnell managed to do was to pass the voucher-like tax credit plan (which has been criticized for only allowing those providing scholarships to poor kids to write off a mere 65 cents of every dollar spent, or less than similar plans) and a weak charter school expansion that has only allowed four new charters to be opened this past school year. Nor has he done a good job of supporting those he has charged with leading his school reform efforts. One state secretary of education, former Black Alliance for Educational Options boss Gerard Robinson, left the job after a year of getting little done to become Florida’s school chieftain; Robinson’s successor, Laura Fornash, hasn’t had much success either. Nor has McDonnell helped himself by keeping state Superintendent Patricia Wright in her spot. She proved that she lacked the understanding of the state’s role in education — laid out in its constitution as being in charge of developing “an effective system of education” and to “ensure that an educational program of high quality is established and continually maintained”, when she declared to the Washington Post that it was “not reasonable” to expect the state to make sure every school provides children in the state with high-quality learning. Thanks to McDonnell’s poor leadership on the education front, the state continually abrogates its responsibility to help every child get the learning they need to be the future taxpayers and economic players the Dominion State (and the nation) needs in an increasingly knowledge-based future. Virginia’s fecklessness on school reform isn’t shocking. What is amazing is that the Obama administration will allow the state to get away with it. The Department of Education ignored concerns from its own peer review panel about the waiver proposal. The panel noted that the Old Dominion’s efforts on getting at-risk students back on track “predominantly revolve around remediation efforts” and not on providing those students with strong, comprehensive curricula, while its response to intervention efforts to keep kids out of special ed didn’t match up with the state’s woeful standards. The fact that Virginia’s proposed “proficiency gap groups” system of accountability wouldn’t be applied to most of its schools essentially means that the performance of the poor and minority kids they serve would be ignored altogether. In short, Virginia should have never been granted a waiver. More importantly, Obama and Duncan shouldn’t be giving out waivers in the first place. Once an administration engages in a process that allows it to hold one state to low standards, it will lower the bar even further for everyone else. States such as Iowa (whose initial No Child waiver application was rejected by the administration last week) and California (whose ideas for a waiver application are even worse than Virginia’s plan) should petition the administration for consideration. And the price is paid by our children, who deserve better.